Today’s post is just a quick game that I play with my students. It’s a fun way to practice rhythm, reinforce listening skills, and the kids love the competitive element. And it can be adapted for any level! In Forbidden rhythm, I clap a rhythm, and the students echo. For older students, I might mix in other body percussion to make it more complex, or even move to an 8-beat rhythm instead of the usual four. 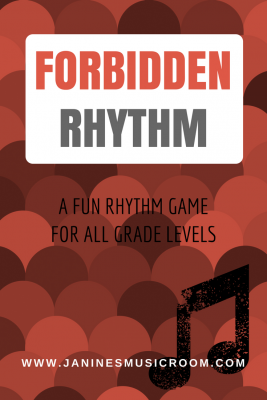 In either case, there is one rhythm that is forbidden: the students may not echo this one. If any of the students echoes the forbidden rhythm—or even starts to—I get a point. If none of the students echoes it, then they get the point. What are your favorite rhythm games to play with your students?